It warmed up a few days ago and the ice melted on Flat Creek, which runs through the refuge. These bull elk used the warmer weather to eat the grass exposed along the edge of Flat Creek as the snow melted back a little. Two of the bulls have a broken antler. Can you find them? There are about 7,500 elk on or near the refuge at this time. Refuge workers are feeding these elk alfalfa pellets every day this time of year, but they prefer natural foods when they are available. These large bulls will start shedding their antlers in March. After the elk leave the refuge this May, local boy scouts will gather the shed antlers and sell them. 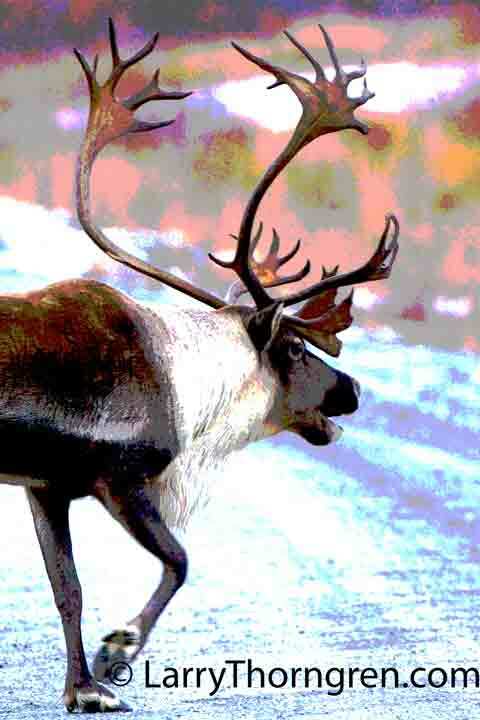 An Elk Antler Auction is held in Jackson and attracts buyers from many states. Artisans buy the antlers to make chandeliers, furniture and other items out of the antlers. The money earned by the scouts is shared with other community charities. 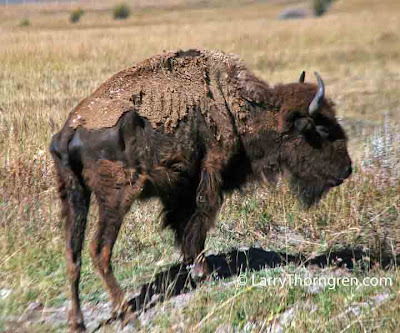 This Grizzly Bear has taken this Bull Elk away from the Canyon Wolves and has pulled it up next to a tree and covered it with grass to keep the wolves away from it. The black alpha male Wolf is trying to convince the Grizzly to leave and let the Wolves have the Elk back. It didn't work. The Grizzly stayed on top of the dead Elk for three days and only left to occasionally get a drink from the nearby lake. He didn't leave until he had eaten the entire Elk. Yellowstone Grizzlies have learned to follow wolf packs, knowing that sooner or later they will kill an Elk. The Grizzlies then take over and the wolves have to go hunting again. This makes it difficult for the wolves to raise their pups. Hunting Elk is dangerous and exhausting work. This past fall, I had to be careful every time I was near the Canyon Pack because a very large Grizzly called Scarface would show up within the next hour or so. He followed the wolves wherever they went. Four mange infested members of the Druid Pack make an attempt to kill an elk(the elk eventually escaped) in the Lamar River(Fall 2009). The wolves have very little hair on their tails and hair is missing in big patches on their bodies.and at least two of them are handicapped by the large radio collars around their necks. You can see the big radio-collar on the black wolf next to the elk. 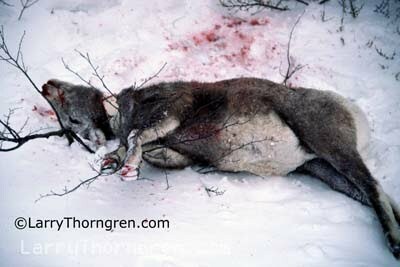 The combination of mange and radio-collars proved lethal and these wolves all died within a few months after I took this photo. The Druid Pack is Gone! 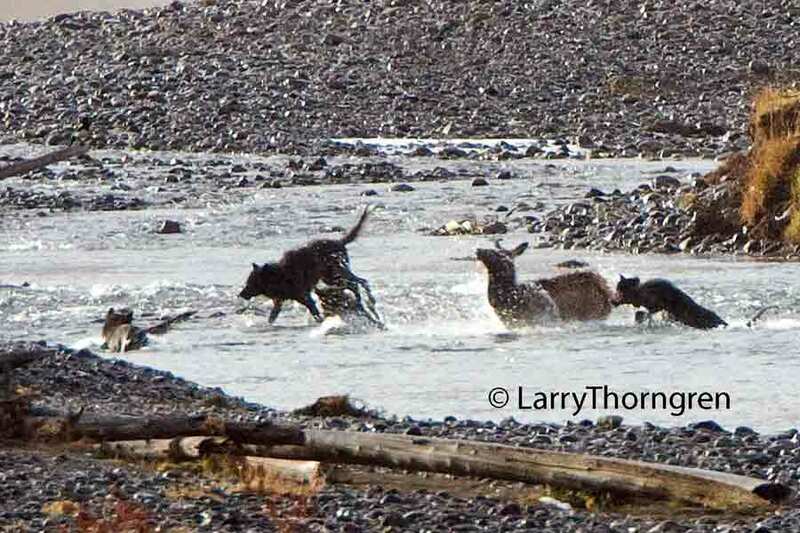 The wolves kept this elk in the river for several hours. At one time there were seven wolves swimming after the elk. Each time the wolves tried to grab the elk, she managed to stay just out of reach. In this photo, the elk has just struck with her hooves at the three wolves on the left and they are scrambling to get out of her way. The mange infected wolves would get cold and retreat to shore to get warm. The radio collared wolves would spend time scratching at their collars. 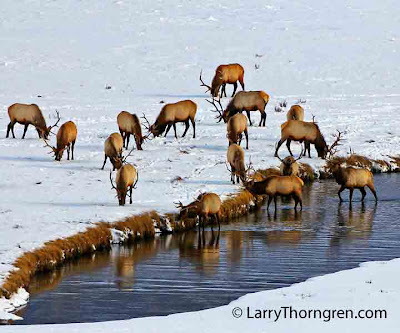 Finally they were all stretched out in the sun and the elk was able to slip away. I found myself with mixed emotions while I watched this dramatic event. I wanted the mange infested wolves to catch the elk so they could survive, yet I found myself cheering for the elk each time she dodged them. I also cursed the idiots that put these huge, intrusive radio-collars on the wolves. It has been a long hard winter and this fox's coat has been bleached by the winter sun. 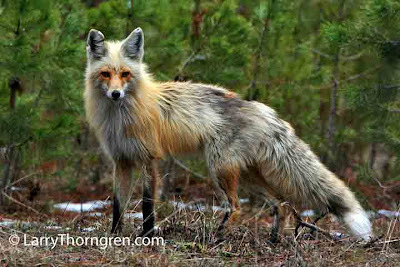 The fox is starting to shed its' winter coat and looks a little ragged. I took this photo last spring near my property in Donnelly, Idaho. This fox and its' mate had a den with six kits. The den was dug up a week later by someone's dog and I don't know if the kits survived or not. I didn't see them again. As human population continues to expand into areas occupied by wildlife, animals, such as this large mule deer buck, often are forced to come into towns to eat the shrubs and lawn grasses in order to survive the winter. I was driving through a town in Alberta a few years ago, when I spotted this huge buck posing in front of this man-made rock wall. I took this photo from the window of my pickup. I have learned over the years not to get very specific about the exact locations of wildlife that I photograph. I don't like to try to retake some of my photos, only to find fifteen other photographers and a tour bus full of Japanese tourists crowding the wildlife that I used to have by myself. This fox is looking at me like: "OK, You got me to pose on this stump, now what do you want me to do?" Foxes are very agile and can leap up on stumps much taller than this one. 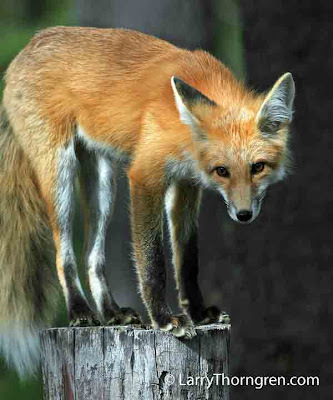 They have great balance and can trot down small downed trees with ease. They will get lots of practice in Idaho where I live in the summer, because we experienced two major wind storms that downed hundreds of trees in my neighborhood this past summer and fall. I stood in my yard during the first one and watched large trees get blown over all over the area. I lost the tops of four trees and could hear huge Ponderosa Pines going down near close by Cascade Lake. Power lines were down everywhere and roads were closed with large trees blocking traffic. Quite an event. 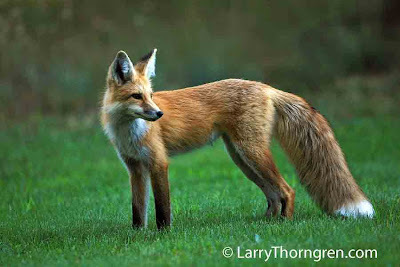 Here is another photo of a red fox that lives near me in Donnelly. He would show up last fall every afternoon and proceed to wander around on my property like he owned it. Of course, I took every visit as an opportunity to take lots of photos. 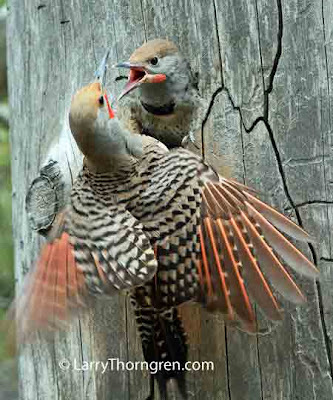 I use Canon equipment for wildlife photography. Not that it is any better than some other brands, but once you buy some expensive lenses, you can't afford to switch. When people ask me how I get some of the wolf photos that I do, I always tell them my secret: BE THERE. The way to find wolves is to spend lots of time where they live. Most of the time that I see wolves, they are too far away to get decent photos of them, but once in a while I get lucky and get a photo like this. The Pronghorn fawn seems to be taking it all in. The drive to reproduce is one of nature's strongest. This Pronghorn buck set up and defended his territory against other males for this one goal. Pronghorns mate in September and give birth about the first of June. Twins are most common and young female pronghorns can mate when they are about sixteen months old, which gives Pronghorns the ability to rapidly increase their population if conditions are favorable. 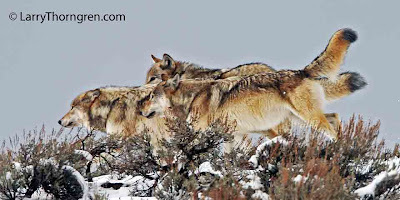 Wolves in Yellowstone have decreased the Elk numbers and the Pronghorns have benefited from the availability of more food. The Pronghorn bucks have been growing larger horns in the last few years, because of better nutrition. Pronghorns are the only hollow horned mammal to annually shed their horns. 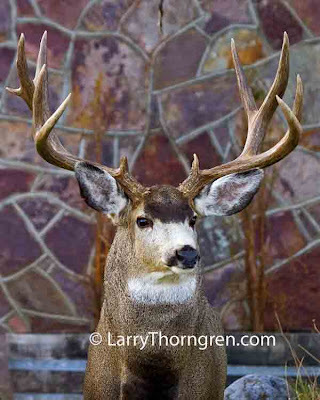 The outer covering of this buck's horn will fall off in late October and will replaced by new growth next summer. The horn is composed of tightly fused hair. 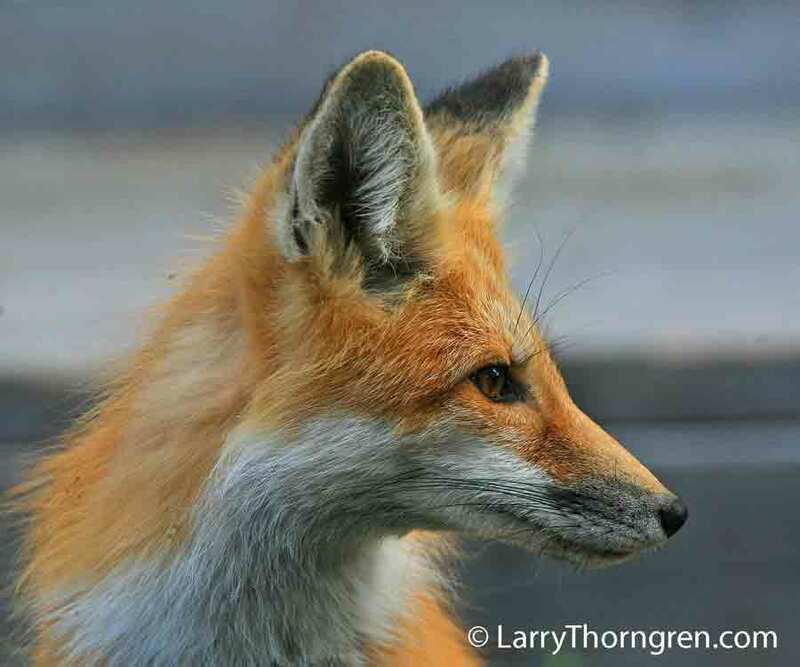 I just received information that the International Wildlife Photographer of the Year Contest is open for entries. This photo was a finalist in the competition last year. Several of my photos have made it to the semi-finals in the past three years, but this is my first finalist. Now I have to decide which photos to send in for this years competition. I plan on winning one of these days. This young owl could fly quite well, but still depended on its' mother to bring it food. 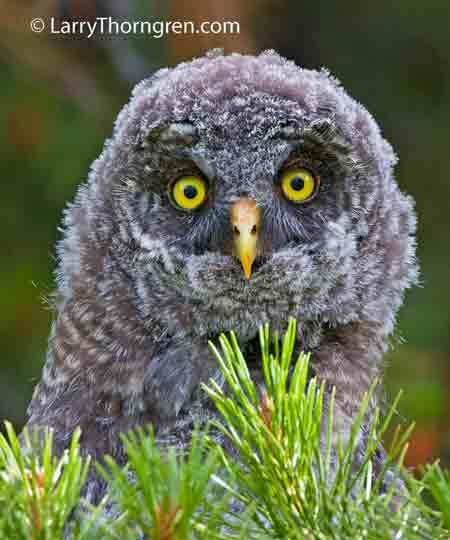 These large owls show no fear of man and are very easy to approach. The hard part is finding them in the first place. I took this photo of a radio-collared female Bighorn Sheep several years ago in Glacier National Park near the Many Glacier Hotel. I had just watched a park ranger shoot the ewe in the head, blowing her brains out all over the snow.. When I confronted him for shooting this sheep, he told me that she had been overdosed with drugs, when researchers darted her the day before, to place the radio-collar around her neck. Since she couldn't get up twenty four hours later, they decided to kill her. The ranger wanted my roll of film because: "It was an un-authorized photo". You can see that he didn't get it. I wonder how many times something like this took place with no one there to observe or record it, or if they were there, they were intimidated into giving up their film. Researchers don't report it when they kill an animal because they don't want to get fired for being incompetent or banned from a National Park. 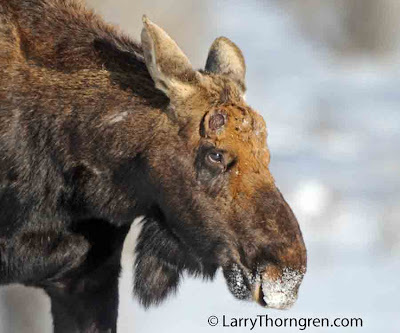 They list animals like this dead Bighorn as "Unknown Cause of Death" in their reports. 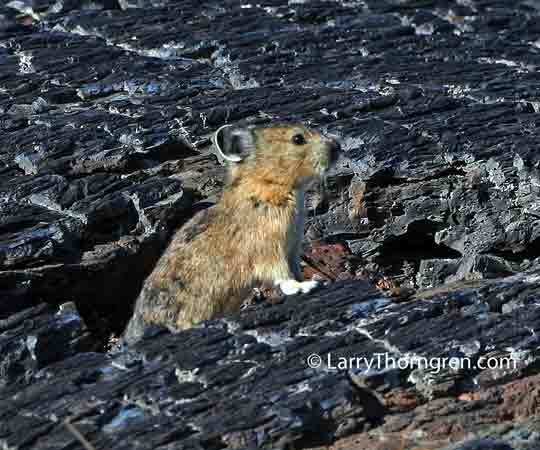 Park officials, like the ranger that wanted my film, try to cover up these type of research mishaps because they don't want to look bad and of the fear that funding may get cut if contributors find out. I am sure this same scene has been repeated again and again, by researchers that use these devices and capture techniques all over the world. If you google "Tracking wildlife by telemetry" you will see that there are thousands of wildlife research studies using radio-collars, going on at the same time, often with the same results. Here is another photo of my resident fox. 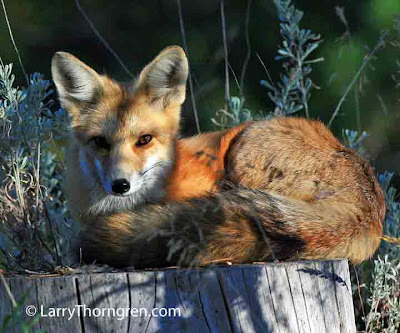 This fox follows me around and watches me while I work on my property. It is sort of like having a small dog only he keeps his distance. He is very polite and will hang around in the evening looking for a handout. There are two fox dens within walking distance of my home which makes it convenient to get photos of the baby foxes in the spring. This fox is posing on my neighbors lawn last September. She is starting to grow her winter coat. Valley County, Idaho protects foxes from hunting and trapping so the foxes become quite tame. 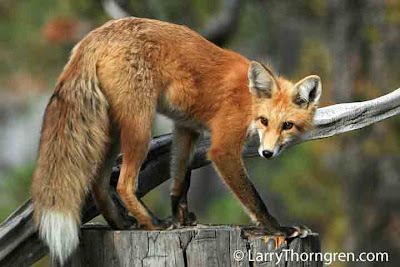 Many county residents like myself really enjoy our foxes. I think this might be a good wildlife protection ordinance for many counties to adopt. Trapping animals like this fox are one of those things that should have been stopped about a hundred years ago. Trapping has no place in our modern world. I took this photo last fall as I traveled through the Tetons on my way to Yellowstone. The fall colors reflecting off of the water gave the photo a very interesting look. 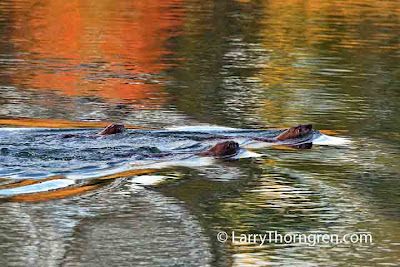 The otters were chasing each other, swimming rapidly and produced quite a wake. River Otters travel in family groups like wolves do and come out of the water to mark their territory by urinating on rocks and river debris similar to the way wolves mark their territory. 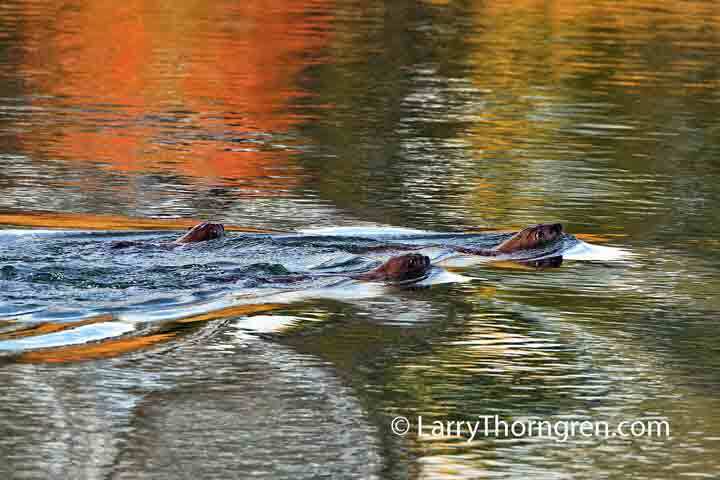 Otters will travel great distances over mountain ranges to get to another river drainage. I have seen their trails in the snow where they toboggan on their stomachs for miles far from water. Young otters that get separated from their family call out with a very loud "chirp". They love to play and spend a lot of time playing in and out of the water. Biologists cannot get radio collars to stay on otter's necks, so they capture the otters and open them up and put radio transmitters in their abdominal cavities. The radios are left in the otters after the batteries go dead. I suspect that makes the otters go dead. Twenty five Yellowstone Bison are going to be fitted with radio collars like this one and the collared females are going to be implanted with vaginal transmitters so biologists can determine when and where they give birth. Sounds like something out of a mad scientist horror movie? It is. I am surprised they don't dye them fluorescent green so they glow in the dark. 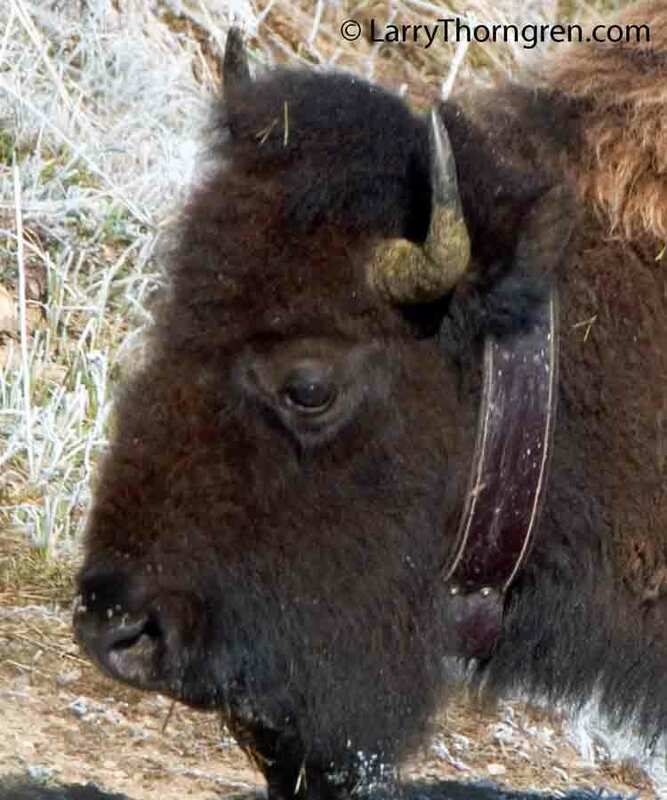 These twenty five Bison will be allowed to leave Yellowstone near Gardiner, Montana this winter and travel through the Church Universal Triumphant property under a $3.3 million dollar deal with the church to let the migrating bison trespass on their ranch on their way to public lands outside of Yellowstone. Sounds like a money- wasting government boondoggle? It is. Yellowstone has become a Mecca for mad scientist type biologists with radio collars, body cavity radio transmitters, and helicopters who treat the animals in Yellowstone like experimental domestic livestock. The administrators of Yellowstone have lost all concept of what Yellowstone was envisioned to be when the park was set aside as a refuge for WILDLIFE. 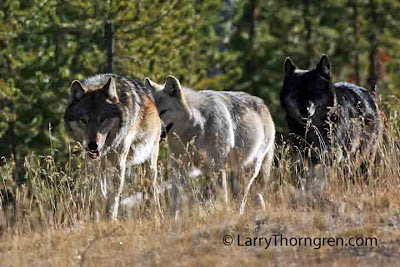 The Canyon Pack adult wolves set out on a hunt. 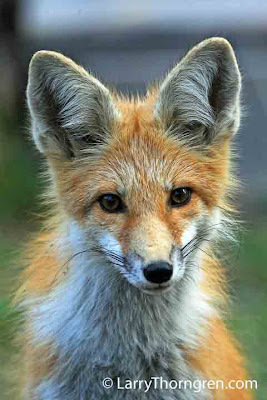 (October 2010) They have left three pups behind, which they will bring food to after making a kill. The Black Wolf is the alpha male and the light gray wolf is the alpha female. The large gray male wolf (non-alpha) leads the hunt, which goes against common lore that the alphas are always the leaders. 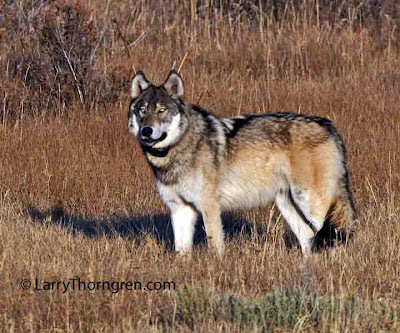 I have observed this wolf pack over three years and the gray male wolf seems to always be in the front leading the pack when I see them. The black wolf has a radio collar. I fear that the new pups will be collared this winter. 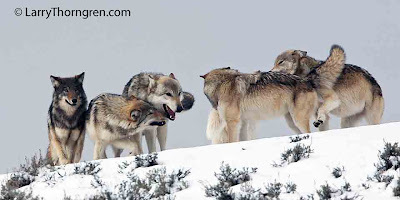 The Yellowstone Wolf Biologists (Led by Doug Smith) just can't seem to leave these animals alone. They get collars donated to them by the Yellowstone Foundation and if enough collars are donated, they put them all on, even if it means that more than half of the wolves get collared. This intrusive study has been going on for over fifteen years and has put collars on over seven hundred and fifty nine(759) wolves. 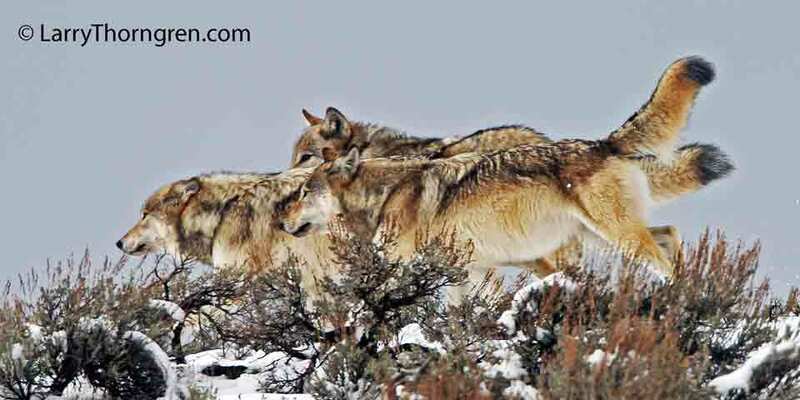 It is time to stop this study and quit harassing the wolves. The Bighorn ewe being pursued by the young rams in the previous photo, climbed up on this ledge where she is being guarded by a larger ram. 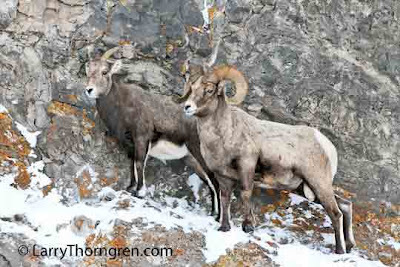 The large mature rams keep the smaller rams from harassing the females and do most of the mating. When hunting reduces the number of large rams in a herd, the ewes get chased excessively by the young rams. The ram in this photo was the largest ram I have observed in this herd and he is not very big compared to rams in non-hunted herds in national parks. 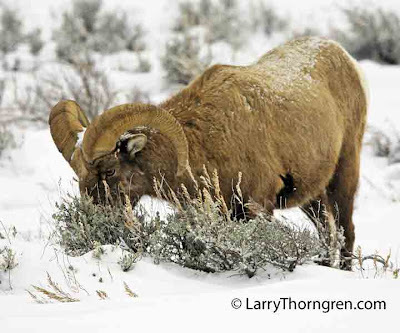 Hunting and killing the large rams for trophies gradually produces a population of inferior rams with small horns. This ram is a prime example. His male offspring will have horns similar to his. 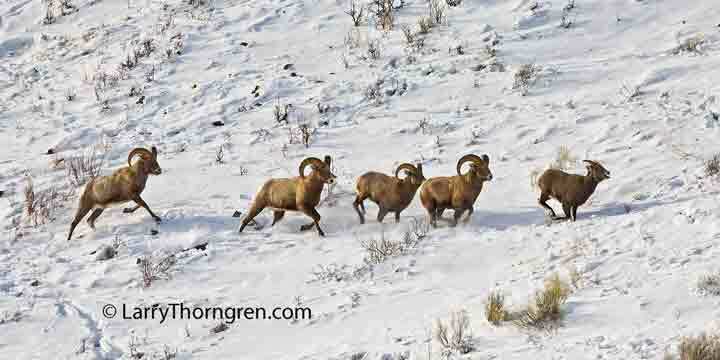 If he gets killed in the next hunting season, even smaller horned rams will mate with the ewes.